Willingboro firefighters respond to numerous incidents each year involving home heating equipment. The types of equipment include gas or heating oil fueled home heating units, fireplaces/wood stoves, kerosene heaters, and portable space heaters. These units are found in heater rooms/closets, living and family rooms, garages, and bedrooms. 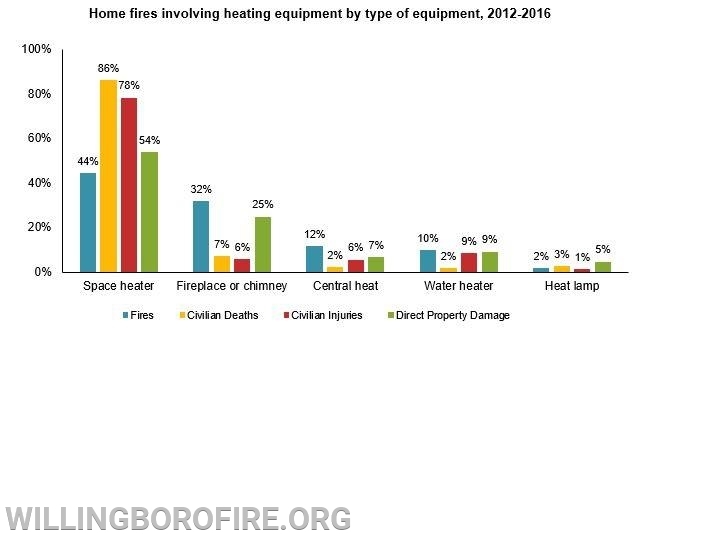 The National Fire Protection Association (NFPA) has provided statistics on home heating equipment fires in the United States from 2012-2016. 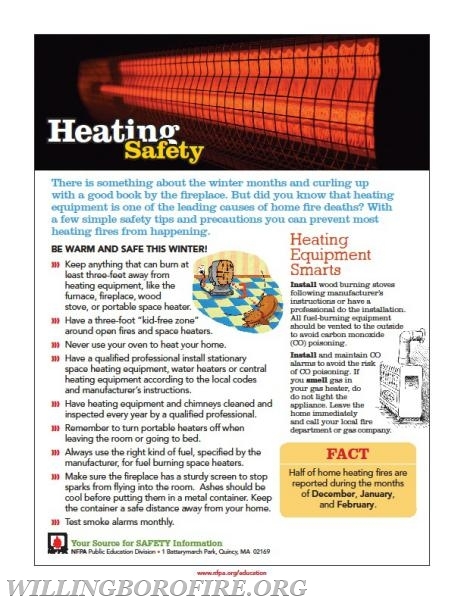 Heating equipment safety tips have also been provided courtesy of the NFPA. In 2012-2016, U.S. fire departments responded to 52,050 home structure fires that involved heating equipment. •Heating equipment fires accounted for 15% of all reported home fires in 2012-2016 (second behind cooking) and 19% of home fire deaths. •The leading factor contributing to home heating fires (27%) was failure to clean, principally creosote from solid-fueled heating equipment, primarily chimneys. •Placing things that can burn too close to heating equipment or placing heating equipment too close to things that can burn, such as upholstered furniture, clothing, mattress, or bedding, was the leading factor contributing to ignition in fatal home heating fires and accounted for more than half (54%) of home heating fire deaths. •Nearly half (48%) of all home heating fires occurred in December, January and February. •Home heating equipment fires peak during 5:00 to 8:00 p.m., but most civilian deaths (48%) caused by these fires occur between midnight and 8 a.m.
•Home heating equipment fires are less likely to occur in the overnight hours between midnight and 8 a.m. (19% of total), but these fires account for almost half (48%) of the civilian deaths. It’s important to remember to turn portable heaters off when leaving the room or going to bed. •Keep anything that can burn at least three feet away from heating equipment, like the furnace, fireplace, wood stove, or portable space heater. •Have a three-foot “kid-free zone” around open fires and space heaters. •Never use your oven to heat your home. •Have heating equipment and chimneys cleaned and inspected every year by a qualified professional. •Remember to turn portable heaters off when leaving the room or going to bed. •Always use the right kind of fuel, specified by the manufacturer, for fuel burning space heaters. •Make sure the fireplace has a sturdy screen to stop sparks from flying into the room. Ashes should be cool before putting them in a metal container. Keep the container a safe distance away from your home.